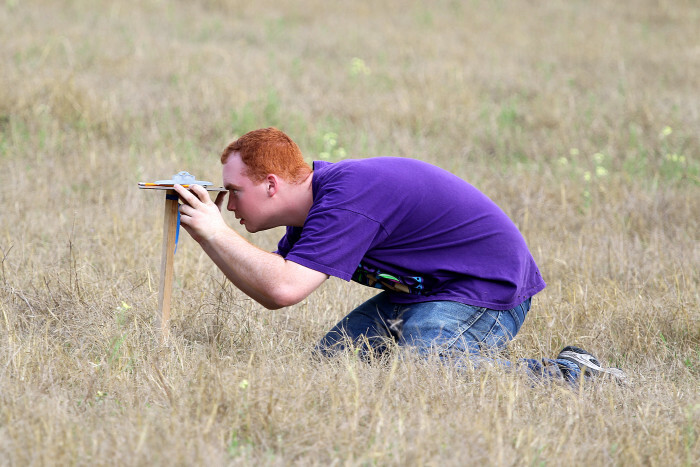 The contest requires students to evaluate three soil profiles and one homesite location. On the soil component, students must identify factors such as seasonal high water table, rooting zone, soil permeability, organic content and slope. Using these factors combined students had to classify land into a capability class and a soil order. Once the soil factors have been identified, students are required make recommendations for vegetative practices, mechanical practices and fertilizer recommendations to improve the site. The homesite portion of the event requires students to evaluate land conditions to determine its potential to develop. Students must identify factors in the soil that would affect lawns and shrubs, septic systems, and foundations to name a few. This requires students to analyze multiple components based on identified conditions. After much preparation and long practice hours, the day of the county contest finally arrived. Kathleen FFA took two teams to compete. The A Team members were Morgan Carlton, Michael Gary, Joseph Julian, and Charity Bowe. The Kathleen B Team members were Joslyn Bynum, Dominick Stevenson, Luis Olivera, and Anthony Frack. The county contest is extremely important to all the teams participating in the event because the winners of the county event move on to compete at the state contest. The Kathleen A Team took first place in the District contest and the Kathleen B Team placed second. Morgan Carlton was the high individual in the contest. Practice time wasn’t over for the Kathleen land judging team. The state contest was only two short weeks away after the district contest. Kathleen members continued to learn and improve their land judging skills to prepare themselves for the state contest, which was held on March 22, 2013 in Bronson. Michael Gary, Morgan Carlton, Luis Olivera, Joseph Julian, and alternate Charity Bowe loaded up and traveled north for the event on March 21 to prepare for the state competition. On the day of the contest the team was ready to put the skills they learned to the test. Dr. Rex Ellis of the University of Florida and staff did a great job setting up a challenging contest for the students. After the members were done competing, all of the teams waited anxiously for the results. After three hours of waiting and a delicious lunch provided by the Levy County Soil and Water District, the results were ready to be announced. The contest coordinator kept the groups attention by announcing the high school division last. The announcer started with the fifth place team. When he announced the second place team, Kathleen FFA had yet to be called. The Kathleen FFA members sat eagerly waiting for the first place team to be announced. Finally, Kathleen FFA was announced as the 2013 State Champion Land Judging Team. Team member Joseph Julian was the high individual in the state, and Luis Olivera was the second high individual. The team and coaches were beyond thrilled with the wonderful achievement. The team will represent the state of Florida in the National Land Judging Contest in Oklahoma City on May 1 and 2. The Kathleen students are working diligently to learn the new rules that apply to Oklahoma soils. The community has really come together to back this team and have helped tremendously with the expenses related to this once in a lifetime learning opportunity. Congratulations to the Kathleen FFA members and coaches. A special thank you to our sponsors: The Lane Construction Company, Kathleen Lions Club, Linder Industrial Machinery, and all future sponsors. Your support makes these learning experiences possible.